Situated between the Sahara, the Red Sea, the Sahel, Central Africa and East Africa, Sudan is a microcosm of the larger African experience. With a diversity of geography, histories, cultures, livelihoods, religions, languages, a unified and constructive future is in the balance. This module provides a general overview of Sudan including information about its history, geography, people and cultures. What is the meaning of "Sudan"? What is the interplay between Sudan's geography and its history? How has Sudan's colonial experience affected the current moment? How are the past and present of South Sudan and Sudan intertwined? What is Sudan's role in the region? Globally? Past and present? How do Sudanese make a living? Module on General Charles Gordon and the Red Book. By Lisa Spiro & David Getman at Rice University. Unravels the story contained in "The Egyptian Red Book," which uses cartoons and quotations from authorities to criticize the British government's handling of General Charles Gordon while under siege in Khartoum in 1884-1885. Discusses research methods used by historians, including examining the original source for key details; identifying significant words to use in catalog and index searches; using newspapers, political papers, and other primary source materials; and comparing multiple sources to get a comprehensive understanding of events. Understanding Sudan's Sudanese Arabic Module. Ali Askouri on the Merowe Dam Project. In an interview, Ali Askouri speaks about the human rights abuses associated with the Merowe Dam in northern Sudan. Learn more from the International Rivers Network. Ali Askouri, Lecture on the Merowe Dam Project in Northern Sudan.Ali Askouri speaks at the University of California, Berkeley on the forced displacement that has resulted from the building of the Merowe Dam in northern Sudan. Learn more from the International Rivers Network. Kerma, an Early Civilization of Sudan, by Dr. Salah Mohammed Ahmed Dr. Ahmed is the Deputy Director of Sudan Antiquities and National Museums. Filmed at the International Sudan Studies Conference, Bergen, Norway, April 2006. Native Administration in Sudan Ahmed Ibrahim Abu Shouk, professor at the International Islamic University of Malaysia, speaks on the system of Native Administration in Sudan. Especially relevant for issues of governance and conflict resolution in Kordofan and Darfur. Sudan macroeconomic policy challenges 2007 Michael Kevane, Santa Clara University. Filmed November 15, 2007. Sudan: Confluence of Arab and African Worlds Produced by Martha Saavedra for the Centers for African Studies and Middle East Studies at UC Berkeley, 1995. It has four segments: Introduction, Geography, Work & Play, and Religion & Politics. There is also a bonus clip at the end (20:00), an example of the Dinka language. While much has changed since this video was produced, especially with the independence of South Sudan on 9 July 2011, some things endure. Sudan: Confluence of Arab and African Worlds ~ Part 2: Geography of Sudan Created by Martha Saavedra. Produced by the Center for African Studies and the Center for Middle East Studies at Berkeley, 1995. Sudan: Confluence of Arab and African Worlds ~ Part 3: Work and Play in Sudan Created by Martha Saavedra. Produced by the Center for African Studies and the Center for Middle East Studies at Berkeley, 1995. Sudan: Confluence of Arab and African Worlds ~ Part 4: Religion and Politics in Sudan Created by Martha Saavedra. Produced by the Center for African Studies and the Center for Middle East Studies at Berkeley, 1995. The Mahdiyya of Sudan Dr. Hassan Ahmed Ibrahim, Deputy Dean of Postgraduate Studies Kulliyyah of Islamic Revealed Knowledge & Human Sciences, and Professor of History at the International Islamic University of Malaysia, speaks about the Mahdiyya in Sudan in the context of Islamic religious movements. Filmed at the International Sudan Studies Conference, Bergen, Norway, April 2006. The transition to Sudan's independence Dr. Fadwa Abdel Rahman Ali Taha of the University of Khartoum speaks on the transition to Sudan's independence (1953-56). Pertinent observations about the Condomiunium period are made. Filmed in April 2006 at Bergen, Norway. The Zar Cult in Sudan Gerasimos Makris, Panteion University, Athens, Greece, speaks on the complex of practices that constitute the Zar (spirit possession) cult among women in Sudan. Interesting observations on religion, gender, and Sudanese cultural practices. Filmed in April 2006, Bergen, Norway. Understanding Sufi Islam in Sudan (with Dr. Albrecht Hofheinz)Filmed at the International Sudan Studies Conference, Bergen, Norway, April 2006. Understanding Tolerance in Sudan during the Mahdiyya (Dr. Robert Kramer) Filmed at the International Sudan Studies Conference, Bergen, Norway, April 2006. Suakin - Old Town 2 A video photo montage of sites in the old port city of Suakin with music by the late Idris Amir BolBol al Sharq, and the singer Jalal Massoud. Suakin Island - video views. The ruins of the old city. Filmed by Caroline Kere. Sudan- video montage. A collection of images from around Sudan set to the song, Ya Gareeb (Hey Stranger) by The Sudanese Band. Visit the band's Facebook page..
Sudan: Fight for the heart of the South. 2011 documentary produced by Jamie Doran for Al Jazeera. Part of a three-part series, Sudan: The Break-Up. Sudan: Fight for the soul of the North. 2011 documentary produced by Jamie Doran for Al Jazeera. Part of a three-part series, Sudan: The Break-Up. Sudan: History of a broken land. 2011 documentary produced by Jamie Doran for Al Jazeera. Part of a three-part series, Sudan: The Break-Up. Videos from or about Sudan. Over 650 video clips about Sudan including music, sports, cultural events, history, comedy. etc. Maps by the BBC on Regional Inequalities. Much of the information is based on the 2006 Sudan Household Health Survey. Understanding Sudan assisted the BBC in developing this piece. Mapping for Results - Sudan. World Bank. Interactive map showing various Bank funded activities. 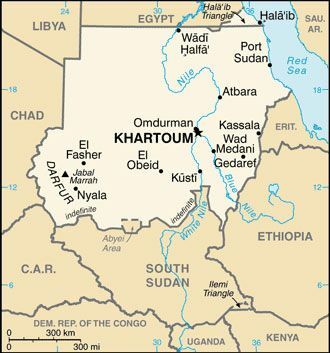 Sudan Maps. From the Perry-Castañeda Library Map Collection at the University of Texas, Austin. Suakin - Old Town 1 A photo collection and history of the medieval port town on the Red Sea. Photos from University of Wisconsin Includes photos from South Sudan by Sharon Hutchison and photos of Gezira Scheme. Search for Sudan when in site. Ryan Spencer Reed - Photojournalism in Sudan Portfolio includes several groups of photos from Sudan -- Darfur, Southern Sudan, etc. The 1905-1907 Breasted Expeditions to Egypt and the Sudan Photos from this expedition are available for public use. The text and images in the Oriental Institute World-Wide Web database are for the personal, not-for-profit use of students, scholars, and the public. Any such use must name "The Oriental Institute of The University of Chicago" as the original source for the material. All text and images are subject to copyright laws and, except where noted otherwise, are the property of the Oriental Institute.